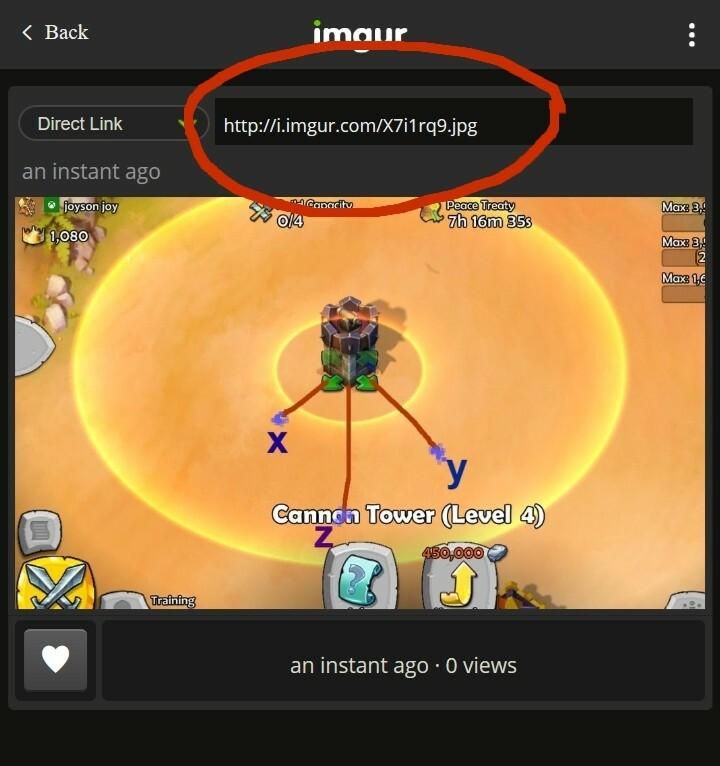 If you click on your uploaded picture in imgur, it's going to give you 5 or 6 options. The direct link is the one you want. I am pretty sure I know the answer to this, but I just want to be sure. When an encampment or tower is under upgrade construction is it disabled, even after attackers knock down the scaffolds? Not talking about when you originally build it, only when being upgraded. It is pretty clear they don't visibly shoot, but you never know on these games. Thanks in advance. Yes, during upgrades they do not work. Castle, ALL defensive towers & emplacements, Watch Signal, Guard House, Resource Production, Traps, even the Church & School.....but you still can use troops and heroes when military buildings upgrade & you still get daily gold from your connected roads from the Castle if it is under upgrade. Some like to do them one at a time.......so it won't hurt their defense as much......I personally like to do as many as possible at the same time.......so I can get it over with.....except for Guard Houses.....also I try to not do GH's and WS at the same time. Welcome to the forum..........lots of help in here and guides........do you belong to an alliance yet? Can someone direct me to where I can get info regarding how its determined when we go into the pool of players to be selected to be attacked. Thats worded weird but basically I want to know why one member of my alliance who is age8 with 2500 crowns can go a whole day without being attacked even with no peace treaty and offline. but as soon as my peace treaty ends and i'm offline i'm attacked within minutes without fail. I"m age 9 which i'm guessing has something to do with it but would like to read info on how this all determined. Friend ask me with Winrich I don't have. How does he work? But also I of Kiev. What does he do. Well being age nine you do get attacked more.....if you have any decent crowns as soon as you log off.......it progresses through the ages..........remember age 6 where you might get attacked once a week or even two.......age 7 once a week or every 3-6 days..........it is not exact......except for when you have good resources and crowns......in age 9 -- it is just more often unless you drop crowns real low or non at all........sorry I cant provide more info........I am new to age 9 lol. Questions are never silly......Winrich's ability can take down grouped towers or defense with each ability.......so level 1 = 1 shot.......he shots in a diamond like pattern........I will find a section in the guide that explains this better..........he can not shoot over walls.......so wall has to be down.......and he has to be protected.......but when he works.......he works well. Experiment with all hero's in the younger ages.......they will serve you well later in the game...........master trebs.......they are the game changers. Kiev works like Richard..........but only on Red Raiders and Rom's.......he speeds them up to raid. There are lots of information in the guide and FAQ section........it is worth a read. Good Luck & ask anything you want to know............several here have vast knowledge and love helping others in the game. Oh and WELCOME to the forum !! Nevsky: Like Winrich, you should look for multiple towers and/or emplacements grouped together. When using his ability, the fire will spread to all things near your target, including walls. Nev can outrange Archer Towers, so no meatshield or distractions are required. Charlemagne: He is finnicky, and has been for quite a while now. Unlike many heroes, you cannot simply click his ability; you must drag it to your intended target. Only do this after you have deployed your mounted units, and only when he has a clear path to the target (usually the Keep). After you have used his ability to target the Keep, do not touch him or any of the mounted units until they have destroyed the Keep. No matter how careful you are, he will occasionally (rarely?) decide on his own to target a wall or other building. Placing him at the back end of the rushing herd will help with his longevity and your prospect of success, if he dies before his target is destroyed your cav will scatter and retarget other things. Richard: His ability provides BOTH an attack and speed bonus, to all infantry/foot soldiers. This includes, blue infantry, red raiders, yellow laddermen, teutonic knights, archers, longbowmen, crossbowmen and cheirosiphons. Sviatoslav: His ability provides only an attack bonus, and only to Red Raiders and Raiders of Muscovy. Charles Martel: His ability will draw the attention of all towers, emplacements, and troops within range of his ability AND (if a tower or emplacement) within the range of that tower/emplacement. Martel’s range is quite large, so it is very possible for an Archer Tower to be within Martel’s Taunt range, and Martel simultaneously to be outside the Archer Tower’s range. If Martel is out of range of the Tower, it will re-target to other troops. Also, if Martel is too close to a Ballista/Cannon or Treb Emplacement, it will re-target to other troops. Best practice is to pick a wall where all Towers can hit him, and have Martel attack that wall. Once the Towers are destroyed, move Martel further in, to attack the Keep or another wall. Keep Martel away from your trebs, because many defensive structures have “splash” damage that will destroy anything near Martel. Martel is very vulnerable when he is not Taunting, so be certain to refresh his ability before it wears off. John Kourkouas: His Terrorize ability sends the opponent’s troops running in the exact opposite direction of John. They will run in terror for about 5 seconds. If they leave the map that’s it they’re gone! If they do not leave the map, they will return to normal, and come back to help with the defence. Therefore, you really want to try to position Kourkouas such that his ability sends them toward a nearby map edge. Conrad: Although he uses a Siege Tower which may seem sucky, even when he exits it, it is an awesome meatshield/distraction. Conrad can be devastating when combined with other siege weapons particularly Alex Nevsky’s catapult and trebs. Although siege weapons are notoriously slow, the most important benefits of Conrad are the defensive bonus he provides, and his ability to draw the fire of Towers and troops. As long as he is first to get into the base, Towers will target him instead of Alex or your trebs. And with the defensive bonus, your other siege weapons can survive much longer than they normally would, taking out several towers in the process. Rurik: He does extreme damage to Towers and Emplacements. He is also capable of climbing walls using ladders, like the yellow laddermen. Therefore, he can be used as part of an attack, or as a first wave, to take out a particularly troublesome Tower/Emplacement. Edward: His ability does great damage, but can only target buildings. As most buildings have relatively low health, Edward is best used on the Keep. Saladin: He can destroy a single target from very long range. He is best used to take out a troublesome Ballista, Trebuchet, or Flame Tower, at the outset of battle. Tariq: His fire only really harms troops, buildings far far less. If facing foot soldiers, drop the fire away from Tariq, but in line with the path the opponent’s troops are walking, so that they must walk through the fire to get to Tariq. If facing cavalry, drop the fire on Tariq, so the cavalry cannot simply run through the fire, and must stand in the fire to attack Tariq. Nikephoros: His ability speeds up the rate of fire for his trebuchet, and speeds up the rate of fire for nearby trebs. 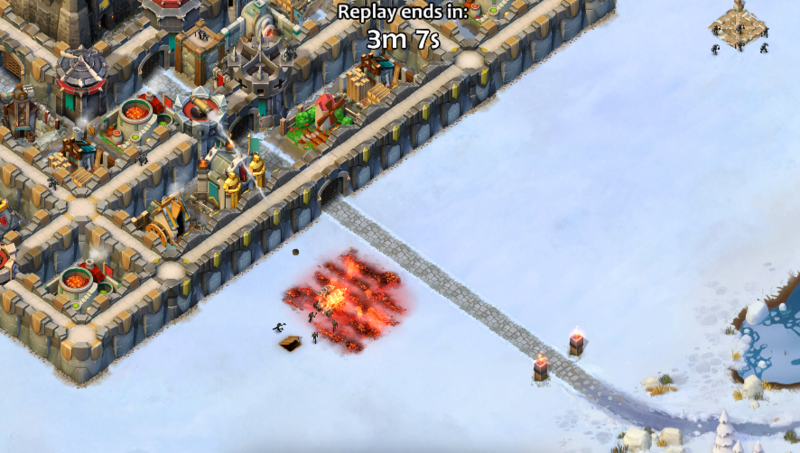 Use ladder troops to spring both inside fire-traps, AND hold-your-ground patrol points. For early Age 5 & below. Kite defenders away with a squad of infantry. Kill them off when they are away from the layout. If they hold their ground, used the squad of infantry to attack any tower outside the walls, and use 2 squads of crossbowmen out the tower while they are occupied with the infantry. Rinse and repeat until all towers are gone. Of towers are behind the walls, use a ram to break them down and then do the above. Once towers are gone, go for the keep with everything you need. 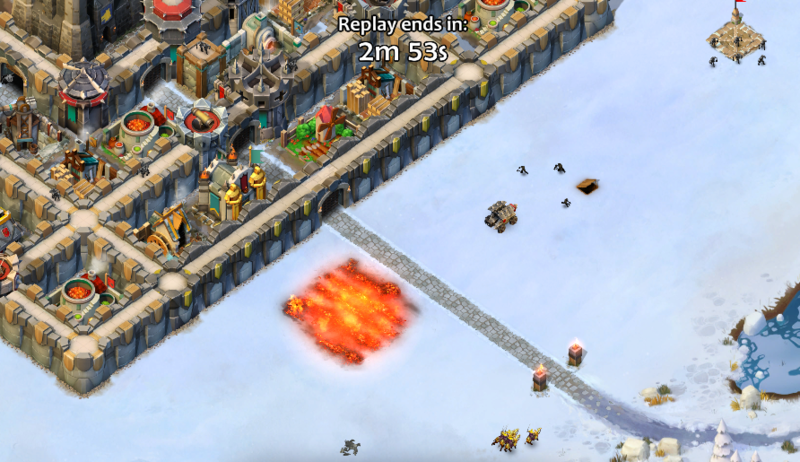 If you have the space in your army, keep 2 squads of raiders to clean up resources while you attack the keep. If you have heroes--Martel is great at level 1. He can draw defenders inside the walls, and is capable of taking down most of the keep before he loses his aura. I have question. I thing you did say trebs take to the next level but catapult units. They die quickly and do not muck damage but to wide spaces at once. I am going to age 6 now and do not understanding the difference but that trebs have higher range and more cost. I have poor language so what is explained but you are simple with that please if you can help me. I have seen people make good use of both trebs and catapults. However, as you get to later ages, the ability to use trebs becomes much more necessary. Trebs and catapults both must be protected. Usually, you can send a squad or two of blues (infantry) out in front of them. They take a lot of damage if you drop them first, and then use your trebs to take out the walls and defenses. Age 5 or 6 is not too soon to join an alliance. Just make sure it is an active one. The best place to look is in the alliance recruitment thread. Not only can you find what you are looking for, there are alliances from countries throughout the world. You may be able to find one that speaks your language and welcomes younger age players. Where can I post about suggestions to improve the game. Or to mention features of the game I dislike. This is useful for kiting when you do not want your unit to get too far ahead of defenders chasing (Get too far ahead of troops you are kiting and defenders will be drawn back to the main battle (at castle) if your dropped troops are closer to them than those you are using to kite). When you click on a unit and drag to where you would like them to go, do NOT unclick at the end. just hold your cursor where it is and your finger down. The unit will stop in place while they wait for the command to finish. You can do the same with a touchscreen by not removing your finger from the device. Additional advice when kiting: Start your kiting unit on the OPPOSITE SIDE from where you plan to attack. That will draw the defenders away at the fastest pace possible, every second is crucial to your success! Engineers are a Trebuchets worst enemy. Losing even one of them before you even get started can be very costly. So before placing them down, it is generally a good idea to scout the area by placing a ram first and have it skirt the wall where you plan to attack from. It will draw out hiding engineers, trigger flame traps, and has enough health that you can drop another unit to take out the engineers and still have the ram around drawing defensive fire when you actually place your trebuchets.